Due to famine in Eastern Africa in the early 1980s, coupled with political and social discrimination against Jews, Ethiopian Jews made their way on foot to Sudan, risking their lives to malnutrition, disease and gangs of desert thieves. Their goal was to finally return to their ancient (3,000-year-old) roots in Israel. On November 21, 1984, the Mossad, working closely with the Jewish Agency, began a clandestine mission, in cooperation with the CIA and the Sudanese Security Services, code named "Operation Moses", to evacuate Ethiopian Jews by airlift from Sudan to Israel. These efforts, made while authorities turned a blind eye or through illegal channels, became public seven weeks later, and the Sudanese President halted all airlifts, fearing Arab reprisals. Approximately 14,000 people reached Israel. Increased political instability, a regime change and considerable risk to the Jewish community in Ethiopia were the catalysts to resuming the rescue in May 1991. 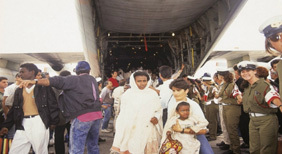 Conducted during a 36-hour airlift in full secrecy, Operation Solomon brought an additional 20,000 Ethiopian Jews to Israel.